Supplying America’s machine shops and manufacturers for over 25 years, U S Shop Tools is proud to announce the release of their 2019-20 Master Catalog. The all-new 572 page catalog contains information and pricing on the company’s large offering of metalworking tools and supplies, including lathe and mill workholding, cutting tools, carbide tooling, cutting fluids, abrasives, measuring tools and toolroom supplies. The catalog features products from trusted brands such as Kurt, Kitagawa, Strong, Bison, YG-1, Lyndex, Carmex, Micro 100, Tool-Flo, Royal, Starrett, 3M, Kingston, Tungaloy, JET, Palmgren, Rustlick, TMX and many other nationally recognized brands. With warehouses in Anaheim, CA, and Warren, MI, most shipments can reach customers throughout North America within 3 business days. In addition, all in-stock items ordered by 7:30pm EST are shipped the same day. U S Shop Tools, celebrating its 26th year, has built their reputation by offering the largest selection of lathe chuck jaws in the United States. With a product line that includes Lathe Workholding, Cutting Tools, Retention Knobs, Milling Toolholders, ER, TG, DA & AF Collets, Abrasives, Measuring Tools, Cutting Fluids and Safety and Shop Supplies, U S Shop Tools has established themselves as the low price leader in the metalworking industry. 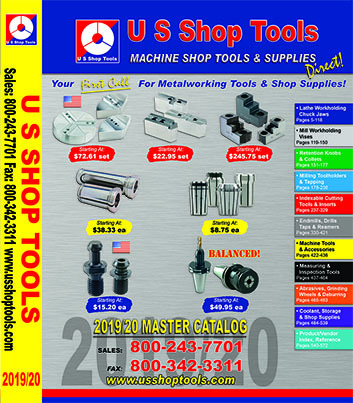 Customers can receive a FREE copy of the U S Shop Tools 2019-20 Master Catalog by calling the company directly at (800) 243-7701 or by visiting the company’s website at www.usshoptools.com.